Carol Ann Duffy took the stage after a brief intro from the chair and proceeded to read poems for the rest of the hour. She began with two excerpts from 'The Laughter of Stafford Girl's High', and ended with the final section. In between she read poems from her collections The World’s Wife and Rapture. I haven’t read the latter, but I had experienced all the other poems on the page before. Unlike prose, where hearing is a poor cousin of reading, most poems that come to life when read aloud, when performed. This is not true of all poems (some are built for the page, some are unreadable), and not all poets are performers, but Carol Ann Duffy did a good job on Saturday of choosing her set list (continuity, variation, humour) and performing it in such a way that the audience never felt like it was missing a trick. There’s always an exception to the rule. In this case the rule is: A short story collection (especially a début collection) can’t make waves. Of course it helps if you’ve done a Tour of Duty at the Iowa Workshop and held fellowships on both sides of the Atlantic. The cynical among us might add the fact that Nam was born in Vietnam (and grew up in Australia), but his collection, The Boat, shoots down expectations that it will play up his exoticism (his word) from the very first story. The session was actually held as part of the Melbourne Writers Festival, beamed into the RBS Main Theatre in Edinburgh’s Charlotte Square via Satellite link-up. The audience in Edinburgh got the chance to ask two questions, just to prove this was live and interactive, though the questions were so astute, I almost wonder if these audience members were plants by the festival, or Edinburgh City of Literature, to ensure they weren’t embarrassed in front of the newest City of Literature. Nam Le spoke candidly and eloquently about how his stories and ultimately his collection came together. A glance at the Q&A section of his website reveals he’s been saying the similar things since March, which isn’t anything against the man, just the world in which writers are forced operate (should they desire to sell many books or at least get reviewed by the NY Times…). I’ve already quoted one of his analogies on this blog and find myself chewing over the thoughts provoked by this session much more than any other I attended over the festival. Not bad for a freebie. Andrey Kurkov is a Ukrainian of Russian extraction who writes in Russian, though he is also fluent in Ukrainian, and Japanese (in which he trained as a translator; this almost led to him joining the KGB), and English (Sunday’s reading and Q&A was all in English) and perhaps several other languages. 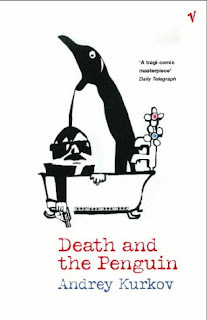 His most well known book is Death and the Penguin. His session, however, fell into the ‘annoying chair who hijacks the hour’ category. When the floor was opened up to questions, I thought, “At last, the books might get discussed!”, only to discover that other audience members were just as interested in what the future holds for politics in the Ukraine—and screw any insights into the books of Andrey Kurkov! When I spend a lot of time by myself, or in the exclusive company of people I have known for a long time, I find my thoughts (and writing) are quite positive w.r.t. human beings on an individual scale. But when I am surrounded by strangers I find I am a total misanthrope. This was, thankfully, not my final brush with the Edinburgh International Book Festival. On Monday, the last day of the festival and a bank holiday (woo-hoo), Marisa and I attended Ron Butlin’s free reading. He read a very short story and two short poems (one of which I’d previously read here). I would like to thank Ron Butlin, and all the other Ten at Ten authors (and whoever at the Festival came up with this new feature) for restoring my faith in book festivals and humankind. Honestly, sometimes you can’t beat a good reading. * the nature of book festivals (see misanthropism, cynicism above and elsewhere).